Skipping around a bit in the book, we're tackling a very season-appropriate recipe this week: witches' hats! 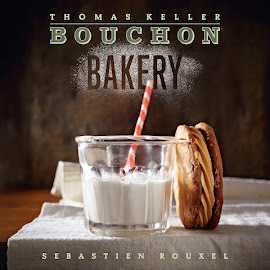 The Bouchon version consists of a speculoos cookie base, topped with a peak of fluffy white marshmallow, and covered in dark chocolate. So tasty and cute for Halloween! A brioche that is soaked in a sweet syrup for flavoring and moisture. 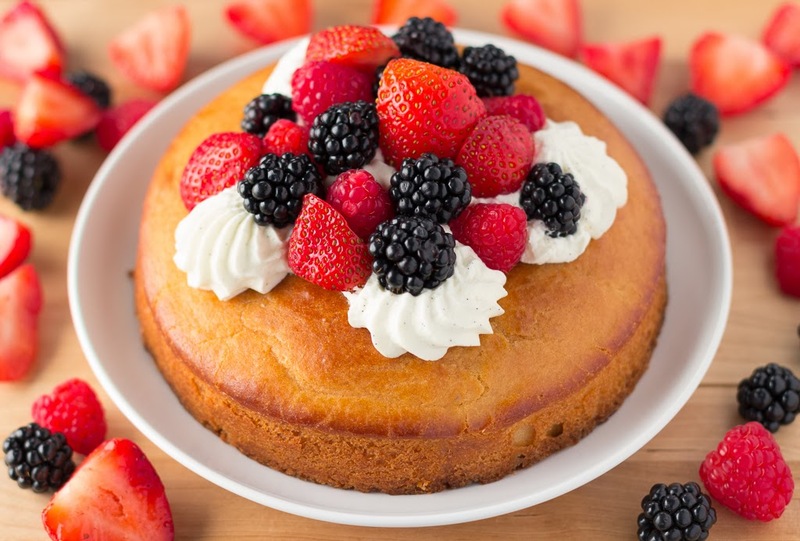 The cavity in the middle is filled with piped whipped cream and fresh fruit. The recipe takes a tropical turn with mangoes, papayas and bananas but feel free to pick your favorite fruits to accompany this treat. Continuing with the brioche recipes, this week we attempted the tropézienne, a pastry originating from southern France. According to the book, a local chef from Saint-Tropez created this pastry while a movie was being filmed in the area. It is traditionally filled with orange blossom scented pastry cream, but this recipe adds Nutella instead, and I can't imagine anyone objecting to that! This recipe was the most difficult in this chapter so far. I made the dough, let it rest overnight, and the next day it hadn't risen at all. After shaping it and letting it rise again for 2 hours, no change. I baked it anyways and it was flat and dry. The yeast failed me! So I ran out to the store again and bought more yeast, and tried again that very night. The second try was better, I could see (and smell) the yeast working. The next day, it was obvious that the yeast had worked. So I shaped it again and set it out to rise, and it was quite sluggish. Maybe my house was too cold, because after over 3 hours, it still hadn't risen as much as the recipe indicated it should. But, I baked it anyways, because at this point I was super frustrated with the whole process. It rose and got nicely browned, but I'm not sure if that's how it was supposed to look. Making the filling was much easier. I made a half recipe of the pastry cream, and it turned out perfectly. Believe it or not, I couldn't find Nutella at Whole Foods. Fortunately, I had a jar of Biscoff spread on hand, so I used that instead. The filling was smooth and delicious, although a bit loose for piping. I did a poor job cutting the pastry for filling, it was a bit uneven. I piped the filling in a swirl and sandwiched the top over it. Maybe it's because I had such a hard time with the dough, but I wasn't impressed with the final outcome at all. The finished brioche wasn't as light and airy as previous recipes. Although the filling was delicious, and I'll remember that for the future, I won't be making the dough again. 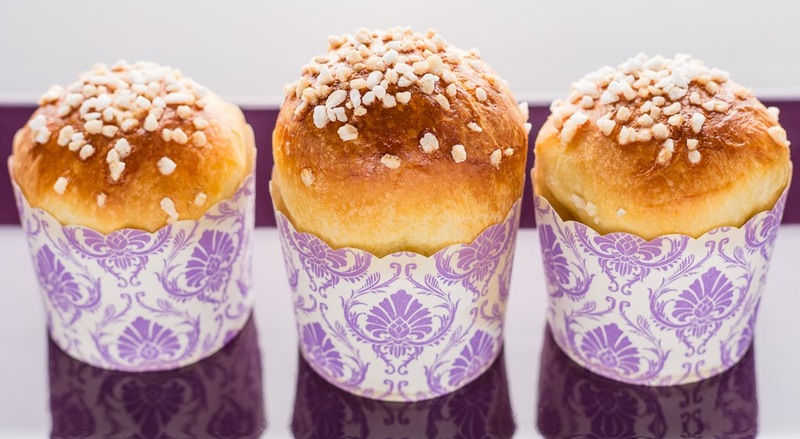 The brioche treats are sweet inside and out, with a sugar cube tucked in the middle and crunchy pearl sugar on top. Candied orange peel adds another note of sweetness and flavor. There is quite a bit of butter in this recipe, so a bit of patience is needed while your mixer kneads (pun intended). And when our bakers went to photograph their creations, coincidentally all the craquelins were shown in threes!